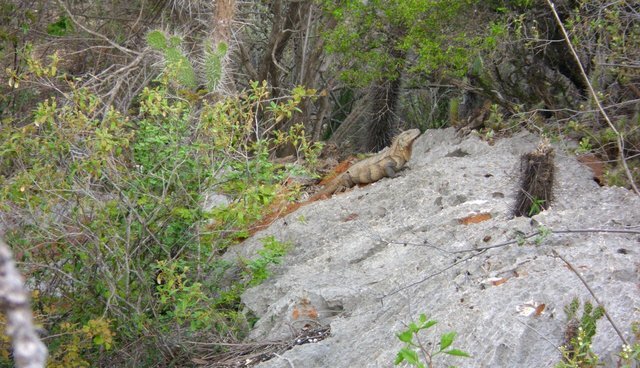 The municipal government in Anse-a-Pitres, Haiti, recently created a Municipal Protected Area, legally protecting 3,000 hectares of dry forest for the conservation of a small population of the Ricord's iguana (Cyclura ricordii). One of only nine iguanas of its kind in the world, this species of large rock iguana has an extremely limited distribution. Only four small isolated subpopulations exist in the south-central part of the island of Hispaniola. Three of the subpopulations can be found in the Dominican Republic, where significant conservation efforts have taken place based on a Species Recovery Plan outlined by the International Union for Conservation of Nature (IUCN) Iguana Specialist Group. The species was thought to be extinct in Haiti until Ernst Rupp, working with the International Iguana Foundation (IIF) and Grupo Jaragua, discovered a small strip of beach where a pregnant female was sighted. Ricord's iguana nests were then found in Anse-à-Pitres in 2007 on the edge of the town, which is adjacent to the southern Haitian-Dominican border, and falls within the Massif de La Selle-Jaragua-Bahoruco-Enriquillo bi-national corridor. This is the only subpopulation currently known to exist in Haiti, but it is threatened by hunting and nest poaching activities. Habitat degradation also threatens the Ricord's iguana, with deforestation for charcoal production and livestock grazing destroying the dry forests of Anse-à-Pitres. These iguanas are also hunted, which further increases the pressure for survival. As the largest endemic herbivore in Haiti, Ricord's iguanas help alleviate deforestation by playing a vital role in dispersing plant seeds. With support from the Critical Ecosystem Partnership Fund (CEPF) through its investment in the Caribbean Islands biodiversity hotspot, IIF worked with community members in Anse-à-Pitres to create the Arrete Communal, the first municipal reserve in Haiti.